Entrepreneurs and managers are facing rapid changes in the markets, customer needs and regulations. Companies are in a constant innovation and optimization mode. 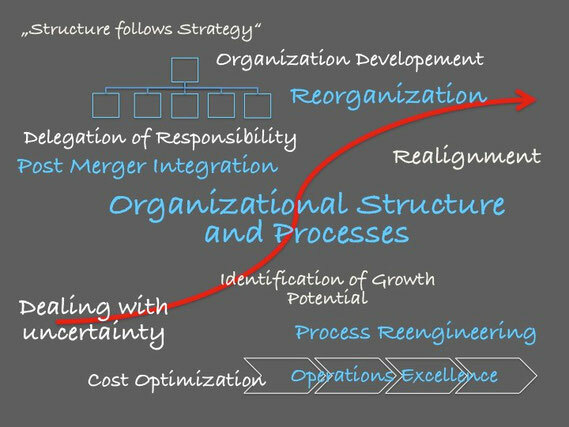 Optimized processes and efficient organizational structure are important components to deal with continous changes. Why Thomas Spitzlinger Organization Consulting? I am offering a „soft“ set of Organization Developement methodology mixed with „hard“ instruments of turn-around and optimization. The mixture of "soft" and "hard" Instruments will be adapted in the right balance for your business needs. I am a very experienced Organizational Consultant with expertise in multi-national and international organizations from different branches mainly IT and Online Companies, Telecom and Media. Based on my project learnings I combine the optimzation of processes with the integration of Process Management in the Management framework. Therefore the efforts of the project optimization are not get lost after a while and are used for the constantly adaptation and optimization of your processes. The sustainability of your investment is guaranteed by this Process Management approach. Many companies are driven case-by-case and adapt the organizational structure without having a Blue-Print. Reorganization projects are therefore on-going necessary often without the needed success. Optimized organization structures are improving the accountability and make the company attractive for the best managers. Efficient organizational structure avoid unnessary redundancy and enable optimized communication and coordination. I was responsible for the Organization Development of an international organization which has increased its head counts from 300 to 3.500 employees in only six years. I know the hard efforts to manage growth and to get things done in a very „flexible“ environment.